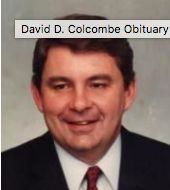 Lt Col. David D. Colcombe, USMC (retired), of Front Royal, formerly of Dumfries, 77, died peacefully with his family by his side on January 10 in Winchester, Virginia. The first child of eight, Dave was born to a family of modest means in Pittsburgh PA. In high school, Dave distinguished himself in athletics while attending the renowned Central Catholic High in Pittsburgh. His parents were inundated with mail containing professional baseball offers and college scholarships; however, these offers were unopened since they were viewed as unobtainable. A kindly coach explained the idea of a college scholarship to Daveâ€™s parents and he was off to a full scholarship to play football & baseball at Delaware University. Searching for the same discipline and purpose Dave received from the Christian Brothers at Central Catholic, Dave joined the United States Marine Corps upon graduation from Delaware in 1957. Once commissioned, he played baseball (as the catcher) for the Hawaiian Marines where he infamously threw out Willie Mays during an exposition game. In 1969, Dave received his Masterâ€™s Degree at the Naval War College in Newport, RI. Dave had a 22-year career with the Marine Corps, which, included two combat tours of Vietnam, two Purple Hearts and a Bronze Star. Upon USMC retirement, Dave became a teacher & coach for Prince William County for 21 years. He coached the Potomac High School Varsity Baseball team to 2 consecutive AAA Virginia State Tournaments.